Requiem Aeternam – Manchester Evening News - This young choir, under their gifted director, sing it with almost overwhelming vividness and intensity. A friend and contemporary of Vaughan Williams, Herbert Howells lost his nine-year-old son in 1935 to spinal meningitis, and the big choral and orchestral piece he composed as a memorial, Hymnus Paradisi, is rightly seen as his greatest achievement. His a cappella Requiem, though, which was the quarry from which parts of Hymnus Paradisi came, was locked away in a drawer and not released until 1980, when he was nearing 90 years of age. It is an intensely personal work, not a conventional requiem mass at all: other than two settings of the “Requiem Aeternam” words themselves, he uses passages from the Psalms and ancient prayers. This young choir, under their gifted director, sing it with almost overwhelming vividness and intensity: if your reproduction equipment is not of the highest quality, it may not cope with some of the most impassioned passages. Frank Martin’s Mass is a good companion for it, and Howells’ well known motet in memory of John F Kennedy completes the disc. Requiem Aeternam – Gramophone - A stunning display of beautifully measured and controlled a cappella singing. dBoth Martin’s Mass and Howells’ Requiem were regarded by their composers as being too deeply personal utterances to be allowed into the public domain and both were withheld from publication for 37 and 45 years respectively. Consequently any choir attempting to commit these worlds to disc need to handle the task with exceptional care and sensitivity. There’s no question about the care and sensitivity of Jeremy Backhouse’s approach with his excellent Vasari Singers: when this disc first appeared it was nominated for a Gramophone Award. Rightly so, for not only is it a stunning display of beautifully measured and controlled a cappella singing, but t reaches the very heart of these deeply moving works. However, in the intervening years new competition has appeared and, in the case of Frank Martin’s glorious Mass, James O’Donnell and the Westminster Cathedral Choir produced such an astonishingly powerful performance that their disc not only won a Gramophone Award but was voted Record of the Year. What made their performance so compelling was not the kind of close, almost loving intimacy which is the hallmark of the Vasari performance, but an almost impersonal detachment which renders the emotional impact of the work all the more intense. Things are very different in the case of the two Howells pieces. Again, stiff competition from another award-winning disc has appeared in the intervening years, but in many ways this music seems more the natural territory of the Vasari Singers. With its somewhat peculiar mix of cantata (parts did find their way into the composer’s large-scale Hymnus Paradisi), liturgical psalm and plainchant (deliciously intoned by Mark Johnstone) the Requiem is a remarkably complex work requiring not just the restraint of a choir well used to singing liturgical music but a degree of musical, vocal and emotional maturity – not to mention soloists of the calibre Jeremy Backhouse has here been able to draw from – which, for all their excellence, the young men and boys of St John’s Cambridge cannot begin to match. Just listen to that final, truly profound chord from the Requiem to have the point driven home. The pairing of unaccompanied choral music by Englishman Herbert Howells and Swiss composer Frank Martin is an inspired one. The acerbic rhythms and harmonies of Martin’s 1926 Mass offer an astringent foil to the cushioned late Romantic glow of Howells’s 1935 Requiem. Generally sound performances by the London-based Vasari Singers under director Jeremy Backhouse – there are a few dubious moments of tuning – give depth to the Requiem’s tempered emotion. The inclusion of Howell’s 1964 Motet on the Death of President Kennedy adds to the meditative tone that colours this CD. Formal choral scholars play such a large part in professional music that we forget those who go on to more sensible careers. Where do they end up? Singing for love, not money, in a handful of excellent chamber choirs like The Vasari Singers. The sole fault in this polished disc is that time seems to have stood still, and not just in terms of the repertoire. The clear tone of singers in their late teens and early twenties can sound pinched 10 years later. But it’s not too fanciful to imagine that the life-experiences of older singers will enrich Howells’s Requiem: a work written by a bereaved father. If Howells’s Psalm 23 brings a lump to the throat, its very intimate grief contrasts with the intense drama of Take him, earth, for cherishing, which Howells wrote in memory of John F Kennedy. This is the Vasari Singers’ finest moment, and if Frank Martin’s over-written Mass fails to match this, it’s not the fault of a highly conscientious ensemble. Vasari succeed admirably … It is beautifully done, but the singers also have athletic virtuosity. This is choral singing of a high order. Requiem Aeternam – Penguin Guide to Compact Discs - "...absolutely first class and give a well-nigh exemplary performance." 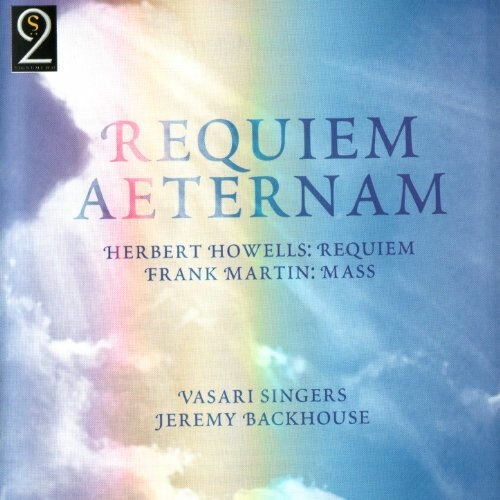 Vasari, a choir conducted by Jeremy Backhouse, are absolutely first class and give a well-nigh exemplary performance, possibly finer than its immediate rivals. The present account is quite masterly in every respect and Vasari get remarkably fine results. A very convincing performance and an exemplary recording. Requiem Aeternam – BBC Music Magazine - A luminous, pliant reading, full of awe and wonder. United recordings have rather a good track record. What’s more, Vasari seem a good find for the label: a versatile, mixed-voice group, with attractive tone, painstaking musicianship and the ability to conjure up some splendid, rich sonorities. I did have a few reservations about Vasari’s last disc on the same label (88020), of works by the former King’s Cambridge choral scholar and early contemporary of the King’s Singers, Humphrey Clucas: attractive, French-inspired music, laden with echoes of Fauré and Duruflé and equally suited to boys’ tone. There the group seemed better at ease with Clucas’s tender Mater Dei sequence than in his appealing Requiem, which needs a more sensual treatment. I have fewer doubts here, however. What is most satisfying is the quality of the breath control, which enables Vasari to do justice to the ‘frozen architecture’ of Howells’s contrapuntal writing. Shifts in dynamic are beautifully controlled; the crucial low bass line is on good form; and while missing the odd final consonant, Vasari hearteningly eschews the upper-line wobble that detracts from even their finest rivals. A luminous, pliant reading, full of awe and wonder (though the President Kennedy motet Take Him, Earth, for Cherishing is rather less well focused). Frank Martin’s Double Mass benefits equally from the group’s care over imitative detail. The attack is good; their rendering has ‘soul’. Just periodically the pitching of notes across a shared part might gain from the type of purity one associates with the Tallis Scholars. There are rival versions, aptly paired, of both main works available; but this will do me nicely.